Disconnect the battery (–) lead wire. Remove the tool set (1) and prop stay (2). 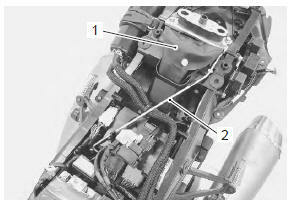 Disconnect the hose clamp (3) (e-33 only) and starter relay (4). 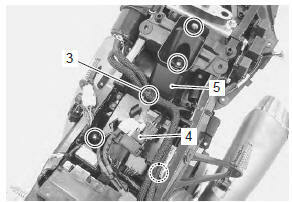 Remove the electric parts holder bracket (5). Disconnect the couplers and remove the ecm (6). Install the ecm in the reverse order of removal. 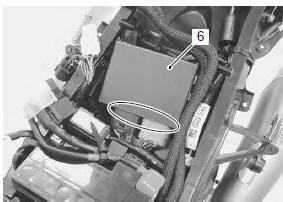 Refer to “dtc “c11” (p0340): cmp sensor circuit malfunction” in section 1a .